The option of a complete Staircase Replacement may just be what you need to complete your home interior remodeling project. Hardwood stair treads provide strength and toughness, but also can make a big impact on the look and style of your home. Decorative iron balusters have become extremely popular with today’s home owners, loving what they add to the interior décor of their homes. Folsom Stair & Woodworks is proud to have shared in many specialty designed projects over its 35 years as a stair and railing contractor. 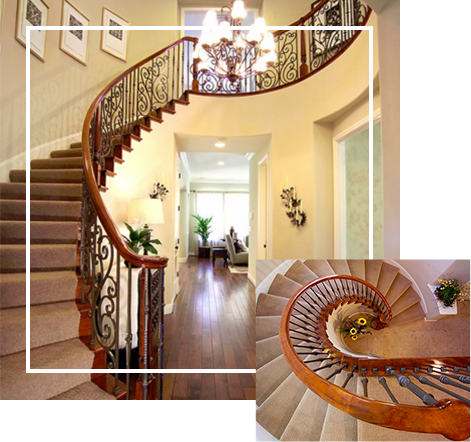 We invite you to explore our website and learn about our products and services in the stair and woodworking industry for Folsom and the Sacramento Region. As a Stair Contractor we can help you update your existing staircase, give you a brand new staircase replacement, or help you design that special staircase for your new custom home. For experienced carpenters, we can help you find the stair parts, hardware and hardwoods you need for your own stair project. We also provide mouldings, flooring and custom-built woodworking projects in partnership with our woodworking associates.